New Zealand's largest lake lies in the heart of the North Island. Taupo is famous for a number of activities based on or around the lake, including golf, hiking, Maori culture, and a host of other pursuits. But the primary draw of Lake Taupo is its’ trout fishing. The Tongariro River is the largest and most important spawning river in the Lake Taupo region. The Tongariro River and Taupo are reputed as world-class fisheries for prime rainbow and brown trout. Distant Waters, one of New Zealand’s finest fishing outfitters offers a variety of packages on Lake Taupo to accommodate anglers needs. A professional guiding two anglers on a five-day walk & wade/helicopter backcountry fly-fishing adventure is one option. Included is seven-nights accommodations in New Zealand’s largest standing solid log structure with rooms overlooking the lake and mountains, catered to by a friendly, experienced staff. Anglers can enjoy warmth and comfort after a day on the water including the chance to unwind in the heated pool and hot tub. Spacious rooms include Internet access, laundry services and a drying room for waders and gear. Meals are served on site, prepared by an executive chef while guests enjoy a cool one at the Waterhole Bar. The price for this package is $6,999 USD per person, based on two people booking, including airfare from Los Angeles. The second is also a five-day/seven night dream trip with the same amenities as the trip above minus the helicopter day. For this trip anglers enjoy three days of guided walk and wade fishing combined with two days of general recreation such as horseback riding, golf, hiking, vineyard tours and more. This package is $6,250 USD per person, based on two people booking, and includes airfare from Los Angeles. 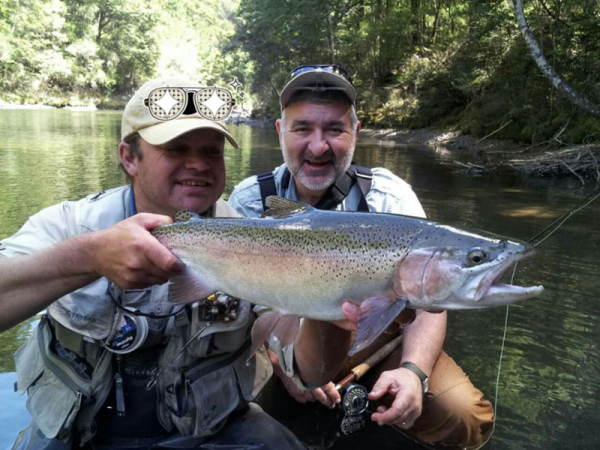 For more information on booking a word-class trout fishing expedition, contact Kevin Wigfield at Distant Waters: kevin@recruitmore.com or Distant Waters.